Ford power steering pumps are identified by basic part number 3A674. The pump used on Cobra Jet Mustangs is known as a "Ford-Thompson" power steering pump because it was manufactured by two companies, Ford Motor Company and TRW (which was known as Thompson Ramo Wooldridge prior to 1965). It's a belt-driven slipper-type pump that includes an integral steel fluid reservoir. The reservoir is attached to the rear of the pump and the pump body is inside the reservoir. A 1969 edition of the Ford MPC lists the 1968 - 1969 service part number as C7OZ-3A674-ARM. 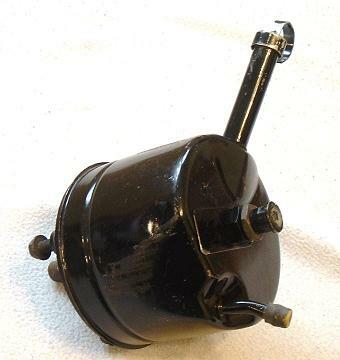 This pump was commonly used on 1967 and 1968 Mustangs, Falcons, Torinos, and Fairlanes equipped with both six- and eight-cylinder engines. During the 1969 model year the pump was used on these same vehicles except if they were equipped with 302 and 351 cubic inch eight-cylinder engines. 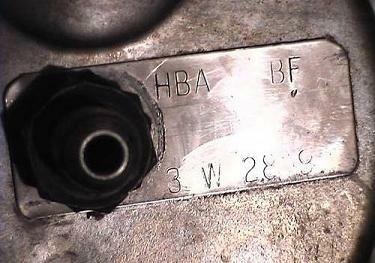 The 1970 HBA-BR pump was also used on six-cylinder Mustangs and 1970 Torinos, Fairlanes, and Falcons equipped with six-cylinder engines. There are also several Mercury applications. Ford pumps are typically painted using a greenish-blue batch color that some people describe as "teal". 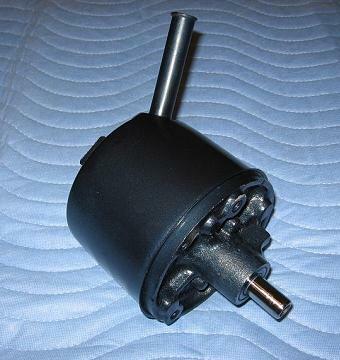 TRW pumps are typically painted a black that is slightly more glossy than semi-gloss. The identifying tag can be found on the back of the pump, under the nut that secures the reservoir to the pump. The high pressure flow control valve exits the reservoir in the center of the back of the assembly. The low pressure input port is angled slightly down and to the right when viewed from the back of the pump. Ford and TRW pumps are distinguished by the information provided on the identification tag. Ford pumps have three lines of text: an identification number appears on the first line, "I F" appears on the second line, and a date code appears on the third line. TRW pumps have two lines of text: an identification number appears on the first line, the second line is blank, and a date code with a "W" appears on the third line. TRW dates codes are formatted "<month> <W> <day> <year>". The first group of characters identifies the month. "W" identifies the Wooldridge part of "TRW". The next group of characters identifies the day of the month, and the final character identifies the year. The "3 W 28 9" code on the tag in the picture above decodes to March 28, 1969. Ford dates codes are formatted "<year><month> <day> <shift>". The first two characters identify the year. The letter following the year identifies the month in Ford's traditional "A - M" system. The next group of characters identifies the day of the month, and the final character identifies the shift (A = first, B = second, and C = third). 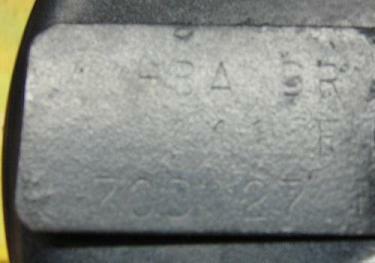 The "70D 27 B" code on the tag in the picture above decodes to April 27, 1970, second shift. The TRW pump shown here is a new service part delivered in August 1969. 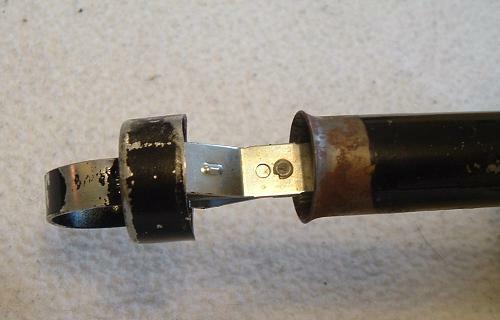 As shown in the picture below at least some of the pumps were painted with the dipstick in place. 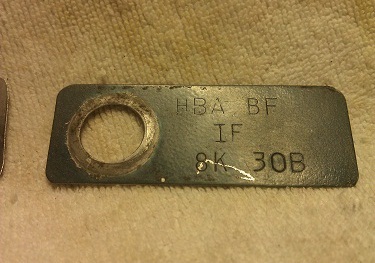 Thanks to Peter Manson, John Spencer, and Jeff Coleman for the HBA-BF pictures used on this page.